The chain pickerel is a popular gamefish of freshwater lakes, rivers, creeks, and slightly brackish estuaries. Individuals are often found lurking among lily pads, or other submerged vegetation, waiting to ambush smaller fish. 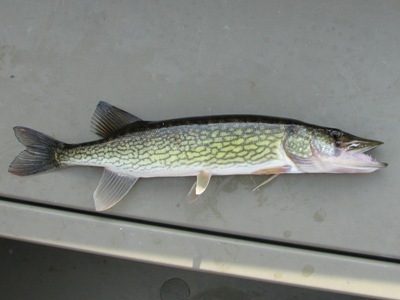 The chain pickerel’s original range was limited to Atlantic and Gulf Coast tributaries, but the fish has been introduced throughout much of North America. Fishing for pickerel is popular for a variety of reasons; they can be caught with basic tackle; they remain active in winter; and they are strong fighters. The chain pickerel is named for its prominent chain-like markings on a contrasting lighter green background. Other names for this freshwater fish include southern pike, jack fish, federation pike, and federation pickerel.